PLEASE NOTE: Packaging will be in collector C-7 quality. Give your favorite Jedi Master a new lightsaber. Did you know that Mace Windu studied the ways of the Sith? Know thy enemy, indeed! Star Wars' Mace Windu was a ferocious fighter with exceptional diplomatic skills as well. His lightsaber was emblematic of his expertise in different disciplines. The purple color symbolized his study of several forms of combat, including the dark techniques of the Sith. This tempting recreation is for costuming, not for fighting the dark side, however. Battery powered (2x "AA" batteries required, not included), the blade telescopes to over 3-feet in length. 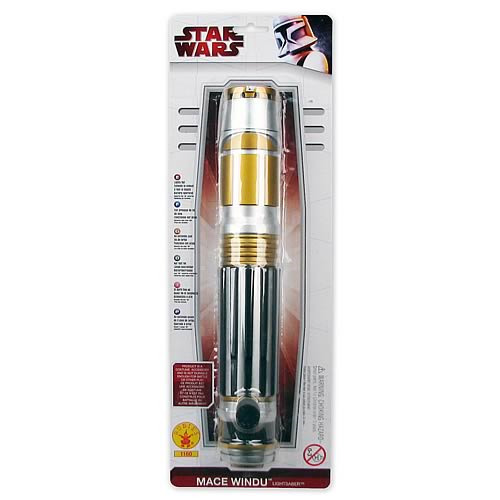 This lightsaber is also unique in that it was made with the gold-colored metal electrum, with the purple hue achieved by using a rare crystal from the planet Hurikane. Now, if we just had an Emperor Palpatine to help recreate Mace Windu's final Star Wars scene... Ages 4 and up.